Rate of Perceived Exertion or RPE has stormed its way into strength training and powerlifting and having a good grasp on how to correctly use and integrate RPE’s into your training can have a massive effect on your long term progress. RPE is used to manage and regulate training numbers from session to session taking into account variables such as readiness to train, sleep and training fatigue. There are some very common misunderstandings and mistakes that lifters and coaches make when it comes to using RPE’s in their training and programming. I often hear lifters and coaches firmly say that RPE doesn’t work, unfortunately for these people, they simply do not have a sound understanding of what RPE actually is and how to implement into their programs. At Melbourne Strength Culture we use an RPE scale to distinguish how hard a particular working set is relative to the individual's perception. The first thing I must clarify is, that no matter who you are, if you are adhering to a structured strength training program, each set within your program contains a level of exertion. This is true for those who use percentage based programming with prescribed numbers or RPE prescriptions. If at any point you have made adjustments to the prescribed loads, sets or reps to alter the difficulty of the set or session, you have utilised RPE based training. This is true for both the coach or athlete making adjustments. Within all programs, different levels or exertion exist and therefore a sound understanding of how to identify your exertion (RPE) and alter your program accordingly is paramount for the coach and lifter. The most common mistake I see when using an RPE scale is the use of “the subjective feeling”. 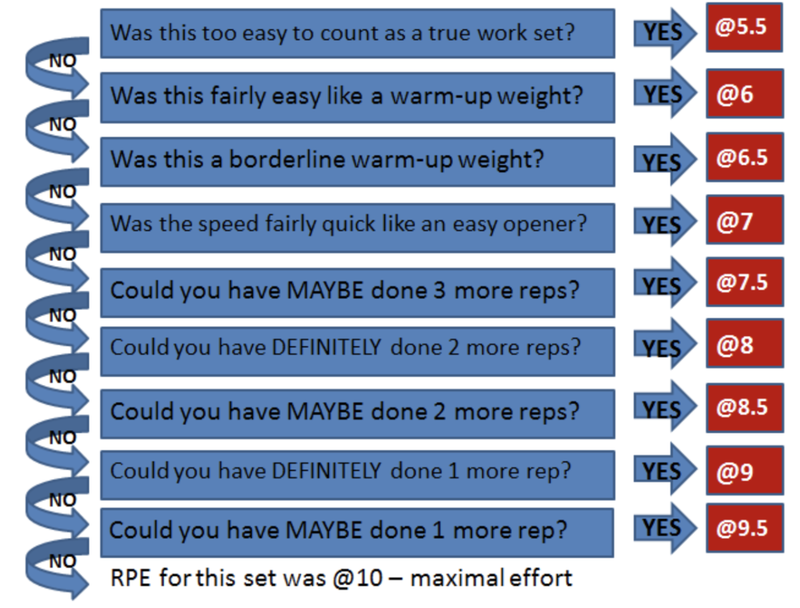 When using RPE scales, it is important to remove as much subjective bias as possible. We want RPE to be used as objectively as possible. An objective measure is one that is not influenced by your emotions or opinions. A person’s height, weight or age would be classified as an objective measure, you can not refute it. Whereas, a subjective measure is open to greater interpretation based on your feelings, emotions and opinions. For RPE based training to be successful, we must make RPE as objective as possible. In order to achieve this we use a scale to rate the level of exertion for each individual set, the RPE scale. Mike Tuchscherer of Reactive Training Systems, one of the most reputable powerlifting coaches and an IPF Champion was the first person to introduce a modified RPE scale in his book the Reactive Training Manual, where the RPE scores are specifically determined by how many reps you have left. See scale below. Using the scale above we now have a clear reference point to measure RPE against. The goal over time is to create a consistent understanding between lifter and coach to ensure that when RPE’s are recorded they are as objective and consistent as possible. From the table above we can see that each RPE for each set should be recorded depending on how many reps would be left in reserve for any particular set. This type of RPE scaling is often referred to as ‘Reps in Reserve’ or ‘RIR’. This simply means that if you labelled a particular set at an RPE 8 then you should have two reps left in reserve and if you labelled it an RPE 8.5 then you definitely had one more rep and maybe a second. A maximum set with no reps in reserve would be labeled as RPE 10. It is important to note that developing a sound understanding of your reps in reserve can take months of practice to perfect. It is not something that can be mastered in one session and like any other skill takes time to develop. Now that we have clearly defined what RPE is, how do we teach the skill of calling one’s RPE? At Melbourne Strength Culture we initially build context by teaching each athlete how reps in reserve works and to be as objective as possible by using the “gun to your head” analogy. This analogy simply means if somebody was holding a gun to your head ‘how many more reps could you have done?’. Be honest with yourself and remove any emotional attachment to how many reps you think you could have achieved, how tiring your day was or any other emotional thoughts you think are influencing your training session. The moment emotion creeps it’s way back into your decision process you are heading back to a subjective measure rather than an objective measure, and as we know RPE scaling must be as objective as possible. We start by prescribing numbers for our athletes and get them to rate and record each set with their RPE. This allows them to become familiar with RPE and develop context to refer back to in future sessions. The goal is to then educate our athletes to a point where we can prescribe a certain RPE for a specific number of sets and reps and the athlete themselves can distinguish the correct weight. For example 3 sets of 5 reps with set 1 at RPE 7, set 2 at RPE 8 and set 3 at an RPE 9. The common misconception when it comes to training solely with RPE is that there is no direction in your training and that RPE allows certain lifters to ‘undershoot’ when they want training to be easy and other lifters to ‘overshoot’ when they want to training to be hard and heavy. This is subjective use of RPE and is the incorrect use of the programming system. Even when programming is fully autoregulated, using RPE in your program still needs to have a specific goal for each and every session. Overarching goals of the program must always be adhered to with the prescription of the variables and the execution by the lifter, regardless if the prescription is RPE based or percentage based. The goal of RPE based training is to create the necessary stimulus relative to the individual and allow each athlete to safely progress long term. There are huge differences between individual lifters as to how many reps they can perform within a set. Prescribing 3x5 at 80% of their 1RM might be perceived completely different for lifter 1 compared to lifter 2. Lifter 1 may perform the first set of 5 and have 5 more reps left ensuring this is an RPE 5, compared to lifter 2 who only has 2 reps left making it an RPE 8. The same protocol is prescribed for each lifter, but a completely different relative intensity is experienced and thus a completely different stimulus a result. The solution to this problem is to prescribe 3x5 at an RPE 5 or 8 depending on the stimulus required for adaptation. RPE can be very daunting and seem quite difficult but with education and experience you will gain a better understanding of how RPE works how it can improve the outcomes of your training programs. Stay patient and understand that like any other skill it takes time to master and to build a sound understanding.